To View each weeks slide show click on the thumbnail below. We have 1 handsome boy and 2 beautiful girls. They were born by C-section. They are so alert and vocal and moving about looking for the milkbar. We are amazed how alert they are and how beautiful they are. The little Tear Drops are gaining weight nicely. They all have their eyes open now and can hold their heads up. They still scoot to the milkbar and Hapi is a wonderful Mom ! She will not allow the other KandL Kidz to get near the whelping box. We call her the Pit Bull ! The little Tear Drops are getting quite plump!! They each have a good seat at the milkbar with only three of them. They all have taken their first steps. They still coo like pigeons as they have not found their bark yet but, oh it will be soon. We have seen some play activity from them as well. We have toys in the whelping box and the little Tear Drops just love to play with them. They are bouncing, jumping and playing with each other. When we walking up to the whelping box they want attention from us. Their littler personalities and developing now. The next couple of weeks will be fun! Puppy Kidz are weaned now and potty trianing has started. It has been fun taking care of this litter. They are all over the house now and the yard. 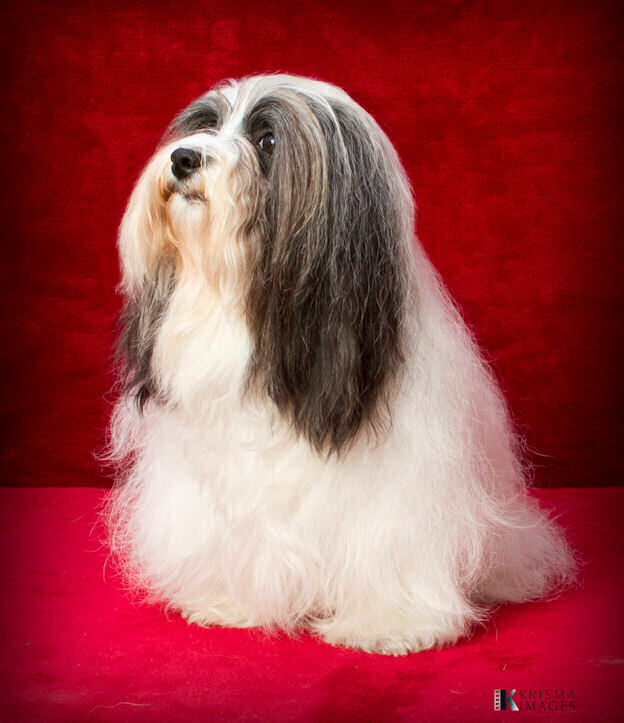 The jump and give us that Havanese welcome when we approach the puppy playpen. They are so cute and loveable. We will miss these guys as they are ready for their new home. 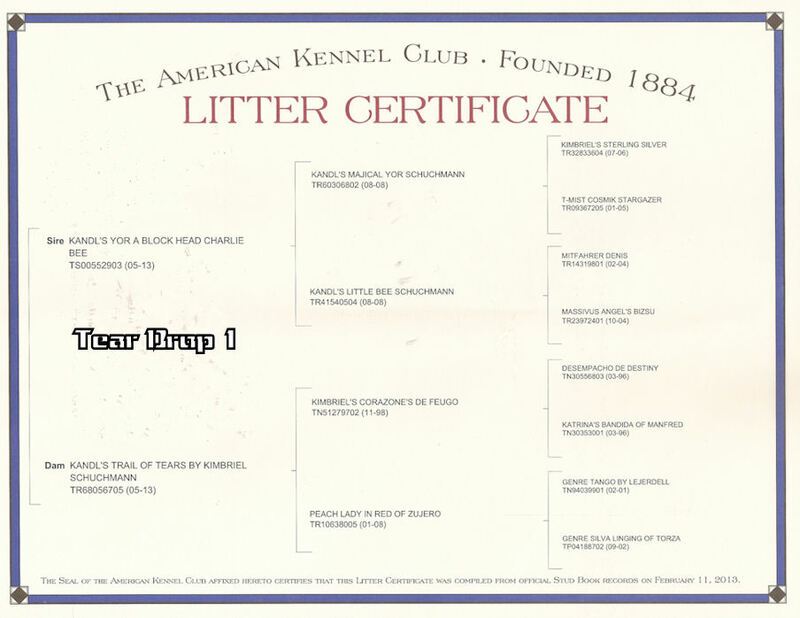 The Tear Drop Litter is named for the Cherokee beliefs and history with the theme of One Earth and One People. We all want peace on earth and we are all one people. All three Tear Drops were born completely white. White means peace and white animals are sacred. The Broken Arrow means Peace. The Sun means Happiness. White Path was a famous Cherokee Chief who did not survive the Trail of Tears. His Cherokee name, Nunna-tsune-ga, translates literally as “I dwell on the peaceful (or white) path”. The Morning Star means Guidance. May we have Peace on Earth, love and happiness, and guidance from the Creator to dwell on the white path. I will draw thorns from your feet. We will walk the White Path of Life together. Like a brother of my own blood, I will love you. I will wipe tears from your eyes. KandL’s Hapi White Arrow Bee Broken, Joey, is living in the Chicago area with his Mom and sister Gracey, Drop 3. Judy, I know this little guy will bring you many years of happiness and warm all hearts that he meets! 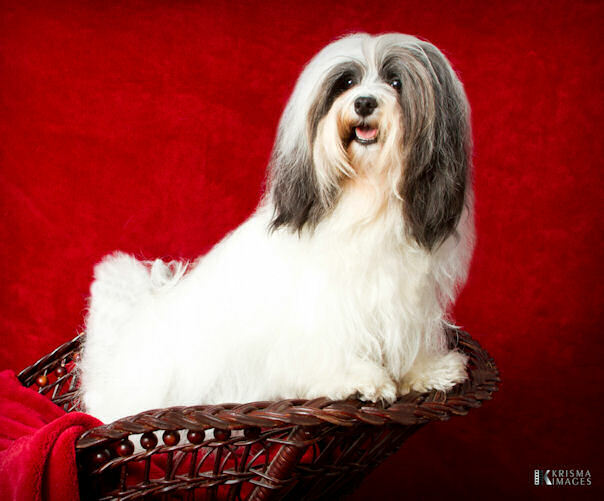 KandL’s Hapi White Cloud Bee Sun, Susie, is living in Iowa with her new family! She has Uncle Joe, and the N. Family as well as Hobbes from the Bee Hive 3. We know that she will bring much love and happiness to her family. KandL’s Hapi White Path Bee Morning Star is now living in Chicago with her Mom and Joey, Drop1. We know that she will Grace your home Judy and everybody in it! Have fun Gracie at doggie day care and be sure to learn from George. Be very good at nap time and take your naps. We know that you are in good hands and your Mom and brother Joey will take good care of you. My Puppy Kidz are 9 weeks old now. They are weaned and starting their potty training. They are so independent and play like little Havanese. I’m so proud of my little Tear Drops. I have enjoyed being a Mom and look forward to the next time. It’s sad also, it’s time for me to say good bye to my Puppy Kidz as each one leaves for his new home. I will kiss them and wish them a happy healthy long life. Their new families will spoil them like they so deserve. Well it’s sad but time to wean the little drops. Mom has been feeding them ground kibble mixed with water. I’m really kinda glad, THEY HAVE TEETH!!! I still nurse them but not as much. Missi thinks that she wants to take over now and nurse them for me. Oh NO, that will never happen. I let her know in no uncertain terms that she can’t nurse my Puppy Kidz!!! Next week Mom will help me wean them completely by keeping them in the puppy playpen instead of the whelping box. We have been bringing them into the family room and playing with them. They are so sweet! Drop 2 likes to do Puli spins like me. 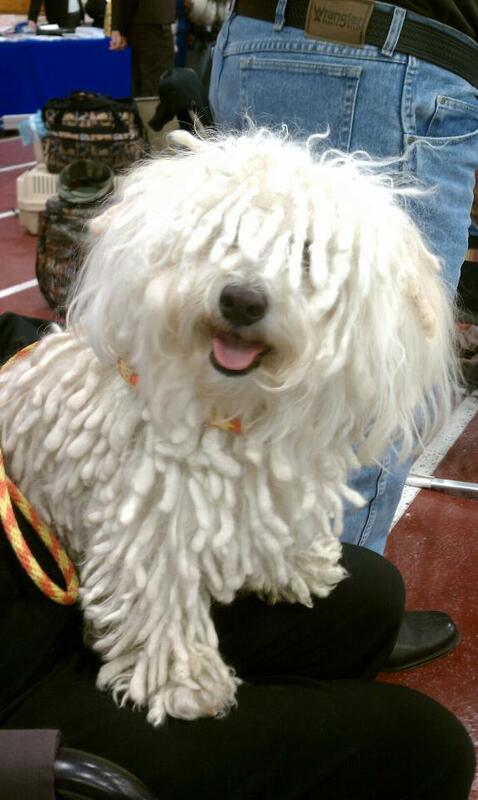 It’s so cute seeing a 2 pound Puppy Kid doing Puli spins. We all just love to play with them and chase them around the couch. They have found the toy box also and we have toys all over the room! Next week we will start potty training. My Little Drops have really grown in the last couple of weeks. Mom and I put some toys in the whelping box for them to play with and they just love them! I don’t have to feed them as much now but wow, when they are hungry they let me know. They are so big now that it’s easier for me to just stand up to feed them! Drop 1 actually crawled out of the whelping box and was running around trying to figure out how to get back in. Mom had to come to the rescue! She also put the ¾ door in the opening so that wouldn’t happen again! All the Puppy Kidz have taken their first steps now and they are still wobbling but walking. They still haven’t found their bark and they sound like cooing pigeons. They are getting so plump, they all have a good seat at the milk bar! I have seen some play activity this week between them so Mom and I will add toys for them this week. They are so cute!! 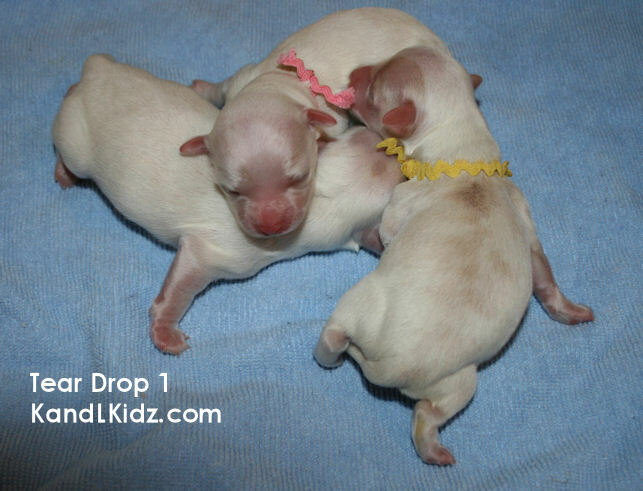 Drop 2 has a birthmark on her tummy. Its so cute! This is the only way Mom can tell Drop 2 and Drop 3 apart they look so much alike. I can’t wait for them to get a little bigger and start developing their personalities. I want to play with them! Missi thinks that she will nurse my Puppy Kidz and tries to get into the whelping box. Well Missi, no way!!!! These are my Puppy Kidz!! Hi everybody its Hapi!! I can take a few to write to you. My Puppy Kidz are getting bigger now and I can leave the whelping box for just a few minutes. My Puppy Kidz are soooo beautiful. I just love being a Mom. That Charles tries to get close enough to see them but I really think he just wants my bully stick so I growl at him and scare him away. When I’m alone in the bedroom with my Puppy Kidz I like to lie just outside the whelping box and chew on my bully stick or on Mom and Dad’s bed. When the Puppy Kidz get hungry I go back in the whelping box and take care of my them. I have to run and make sure that Charles is not stealing my bully stick!! All Hapi does is come downstairs to go outside and do her business then right back upstairs to the Puppy Kidz! She will not leave the whelping box. Mom gave her food and water just outside the whelping box and a bully stick to chew on. All she does is take care of the Puppy Kidz and chew on her bully stick. I tried several time to get close to them so that I could see them but she won’t allow me to get close enough to the whelping box to even get a glimpse of them. We have started calling her the Pit Bull !!! All the Puppy Kidz are gaining weight and growing like a weed. Hapi is a wonderful Mom and I’m so proud of her. She is taking good care of my Puppy Kidz! So good that I can hardly get close enough to the whelping box to see them. She growls at me! So bad that I’m really afraid of her! Oh well, she’s a wonderful Mom. February 6, 2013 6:00 p.m.
Hello, it’s Sir Charles. Hapi started her labor again about 9:00 a.m. Mom got really worried about 1:00 p.m. because she wasn’t progressing as we had hoped and her temperature had dropped really low. The doctor said c-section! So off to the hospital Mom, Dad, and Hapi went. Hapi had a wonderful team of doctors and technicians. She had an anesthesiologist who monitored her comfort level and vitals, a doctor that actually did the surgery, a doctor for the Puppy Kidz, and a large staff of technicians to care for the Puppy Kidz. They were out in 2 minutes flat! The Puppy Kidz were very alert and vocal too. As soon as Hapi woke up she got to come home. Mom kept her and the Puppy Kidz warm in the whelping box and helped Hapi accept the little guys. About 11:00 p.m. her motherly instincts kicked in. I’m happy to report that everybody is healthy and happy! A very special bark out to Dr. Feuerbach and the entire staff at Frey Pet Hospital!! You guys are the greatest!! February 6, 2013 6:00 a.m. I started my labor about midnight last night and now its stopped. Mom stayed up all night with me and rubbed my belly. My temperature has dropped and I’m hoping (NOT) that my contractions will start again. Ugh!! I one week to go!! Yea!! Double Yea!! I’m so measurable and so fat and I only have 3 maybe 4 puppies. I can hardly walk and when Mom picks me up I just grunt. All I want to do is lie around and chew on my bully stick. yoRzy thinks he wants to bother me and I let him know in no uncertain terms to LEAVE ME ALONE!! Mom has been so good at rubbing my belly for me. It makes me feel so loved and relaxed. She even felt my little Puppy Kidz moving last night. Tomorrow we start taking my temperature twice a day; watching and waiting for it to drop. 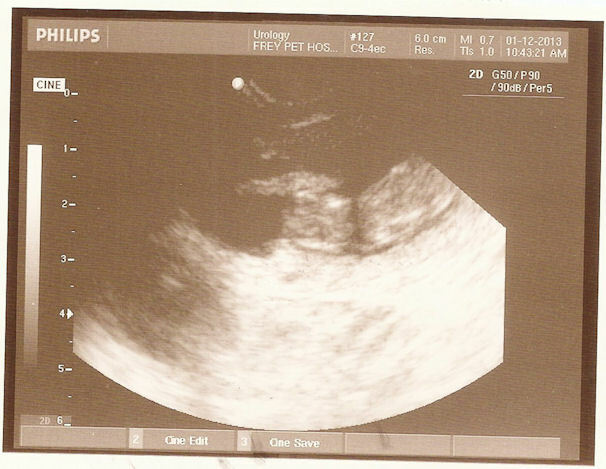 I had my ultrasound today, I have 3 little Puppy Kidz!!! I have one really big one and he was looking at us. We saw his/her nose, face, and eyes. It was soooo cool to see this. Dr J said it was unusual to see them so well and detailed. He/she was saying Hello to us. We also saw the heart beats, yes 3 of them, and everybody look healthy. I get to have my ultrasound performed by the really sweet Dr J, my OB Gyn, tomorrow. Mom felt 3 bumps this week and thinks that it’s Puppy Kidz. My tuck, for you humans waistline, is gone! Oh ya, I’m getting fat! I’m so hungry too and have had some nausea which makes it fun to eat. My Puppy Kidz have toes, whisker buds, claws, and even look like dogs. I can’t wait to see them tomorrow on the ultrasound! Week four! Ok the morning sickness has occurred and Mom is almost sure that I’m expecting. My Puppy Kidz have developed their noses, spinal cords, and their faces are starting to take shape. I have just been sleeping a lot and protecting my bully stick. I have been very emotional as well. I have to be in Mom’s lap all the time. Ok I know that I’m pregnant but Mom still isn’t sure, he he, I’m fooling her! I have been so protective of my bully stick and when Santa came to visit, I wouldn’t let anybody else touch my new toy! It’s my toy and keep your paws off!! I love to snuggle at night with Mom or Dad in bed. I demand my belly rubs. My Puppy Kidz are just embryos and have implanted into my uterus now. I want them to know what petting is so I demand my belly rubs. Two weeks now and Mom isn’t sure if I’m pregnant or not. I haven’t had any morning sickness and the only changes I’ve had is the emotional changes. I want to be held, I want to be in Mom or Dad’s lap and I must get my belly rubs at night when we go to bed. I’m into my first week of pregnancy and I don’t really feel any different except Mom said that my personality has changed. I’m not so shy and I want attention. Anybody comes around I want them to show me attention. I guess it’s the hormonal changes going on. Copyright © 2006 KandL Kidz. All rights reserved.